There’s only two weeks left for Chinese New Year! This is going to be my first time spending it in Suzhou so I hope we can do something interesting. My mother in law says there is a temple fair and the traditional lion dances, let’s see if we can attend without being crushed to death by the crowds. I actually have no idea how crowded Suzhou is during the holiday. All the people that live in Suzhou but are from somewhere else will leave, but maybe there will be tourists from other parts of China visiting us. Sorry for the bad quality, I just noticed the picture is blurry. But maybe you can see that next year’s animal is the pig! There are plush pig toys above and paper pigs to paste on your front door for good fortune. The long paper pieces with characters are also to be pasted on both sides of the door. I have everything ready to be pasted on New Year’s Eve! They will replace the paper dogs we currently have. 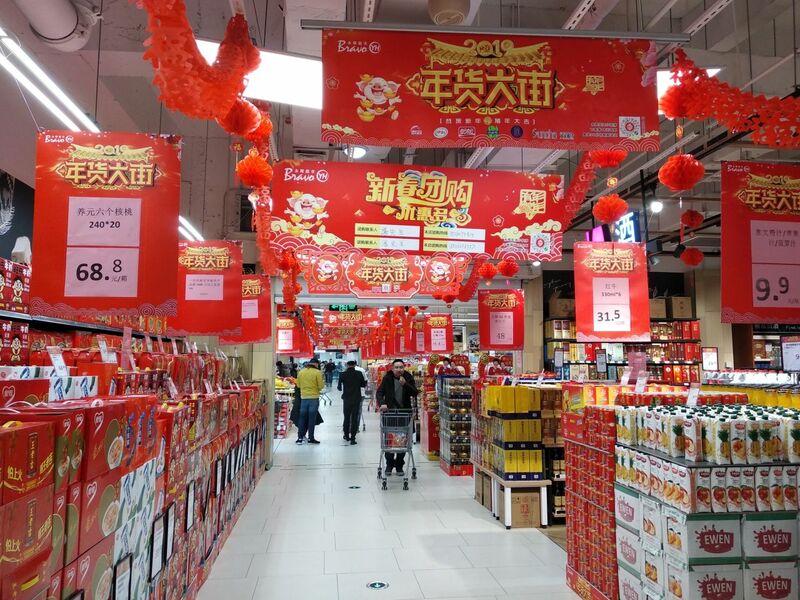 The whole supermarket was decorated with red paper lanterns and garlands. The first banner says: Street of the New Year products. And what exactly are the New Year products? Well, they can be… anything! In China, many people work and live in a city that is not their hometown, and when they go back “home” for Chinese New Year, the custom is to bring edible gifts for family and friends. Nowadays, even if you live in a small village you can basically get anything online, but people still like buying boxes of milk, candies or nuts to bring back to the hometown. Notice how all the boxes on the left side of the previous picture are red. They contain normal, everyday products, but “dressed up” for the holiday! 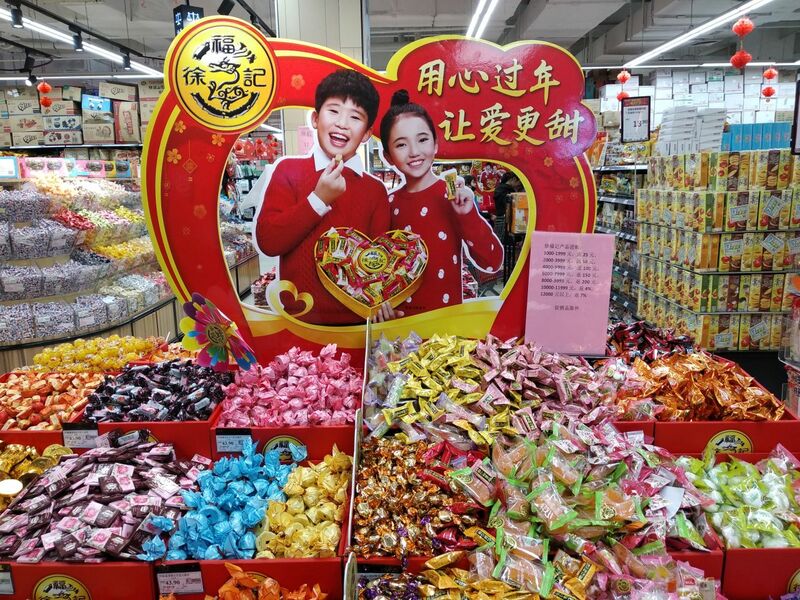 As the main activities during Chinese New Year are watching tv and eating, and as most shops are closed during the holiday, it makes sense to stock up! Candies and chocolates in bulk to fill your own bag. These are offered to the legions of relatives and friends that visit you during the holiday. 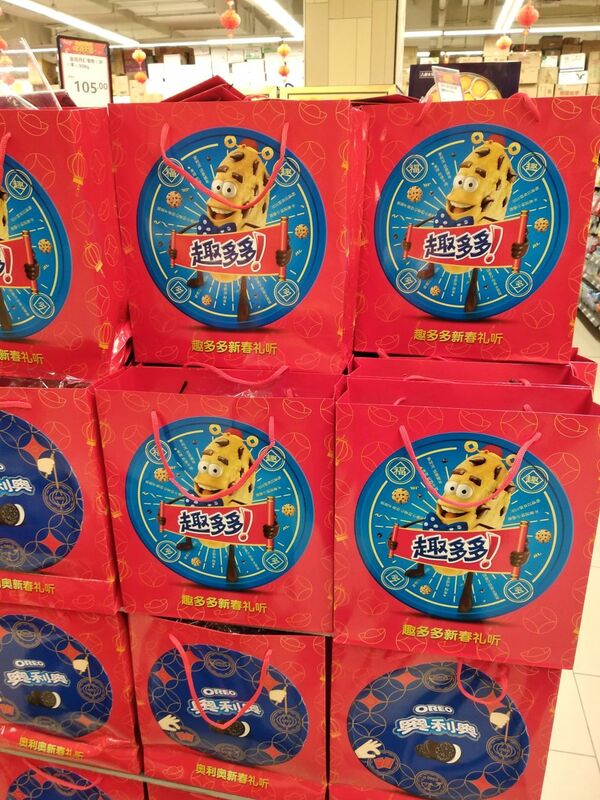 These are a popular brand of rice crackers, also with CNY packaging. Another tradition is to wear new clothes and they have to be red. I have never followed this custom as I only buy clothes when I need them, so I will just wear an old red jacket. 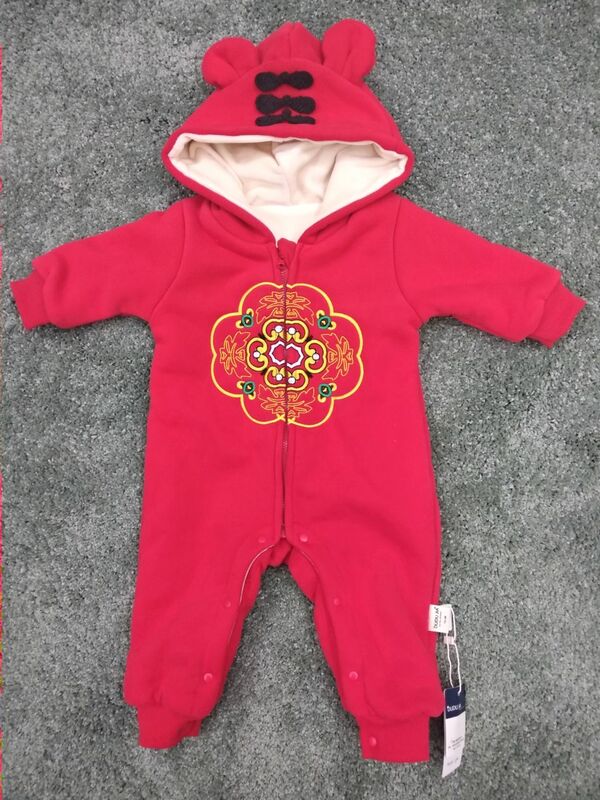 But I did get a special Chinese New Year outfit for Baby A.! I really like it, it’s very warm and soft so he will wear it the rest of the winter too! Chinese New Year is truly the equivalent to Christmas: it’s all about eating and the official colour is red! Well, I think there are probably more CNY activities in HK than in here 😂 I’ve heard young Chinese people saying that CNY is a boring holiday (and one in which they get pressured by relatives with questions like “Why are you not married yet?” and “When are you going to buy an apartment?”). 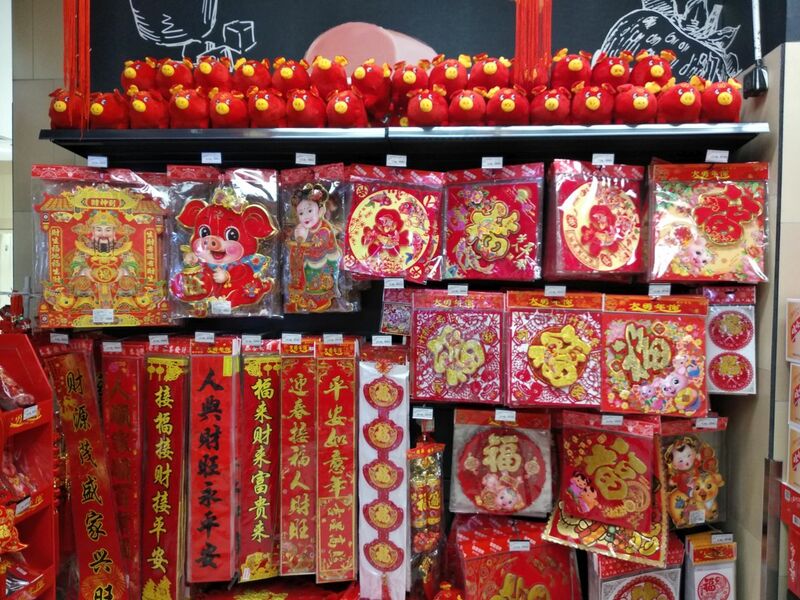 Thank you for sharing such a wonderful post, so we can see how Chinese New Year is where you live. It’s BEAUTIFUL! Happy Chinese New Year to YOU and your family! Every time you post, I learn somethig – thank you! OMG, that little outfit is so adorable. I wish I had dressed Baby D up like that when he was a baby. Like a lot of first generation Americans, Andy ignores the holidays of his ancestral country. So now it’s me trying to keep the Chinese holidays alive for my kid. This year I have a flag, paper lanterns, and a red tablecloth. And red envelopes, of course. Haha, luckily he has you! Bad Andy! I think it’s fun to have two cultures and celebrate the holidays from both. There were many different CNY outfits in taobao and one even had a special pocket to put the received red envelopes hahaha. A pocket for lucky money?! How presumptuous! And oh, the little baby outfit is really cute! Great hehe! Are there any CNY activities there? I know in Madrid the Chinese community organizes a lion dance. The decorations in China are nothing compared to what I saw last year in Malaysia! I felt that CNY was more important there than here! I miss this scene where everything in the shops are decked in red approaching CNY. What are the traditional snacks you serve to guest? Something like this happens in Spain on Christmas right? A friend told me something about being forced to eat way too much turrón. Hahaha! We definitely eat too much on Christmas, yes. And we have so many Christmas sweets which are only available then so better eat a year’s worth of them in a couple of days 😂 Turrón, mazapán, mantecados… they are all calorie bombs! Baby A’s outfit is sooo cute. Oh, dear! I haven’t bought anything for my grandson yet. Even though we don’t really celebrate Chinese New Year, I always get something for my youngest grandson. I hope Suzhou has a lion dance or something. Happy New Year. Happy New Year, Nicki! I don’t know how old your grandson is but Lego released a couple of special CNY sets and they are extremely cool. Not sure if they are available in the US though! I love CNY so much. I always hang huge lanterns I bought in Beijing, from the tree outside my home. People who don’t know me always think Chinese live in my home as I also have terracotta warriors at the front door and the welcome lions but they are there full time as way too heavy to move…(love little A’s new outfit). That’s so cool! Did you have the lions and warriors sent from China by shipping container? Yes. They came back with me in my shipping container after my posting. But I had SO much furniture that I ended up paying for the excess. Worth it though as have some lovely stuff. THAT ONESIE IS SO CUTE!! Love it! 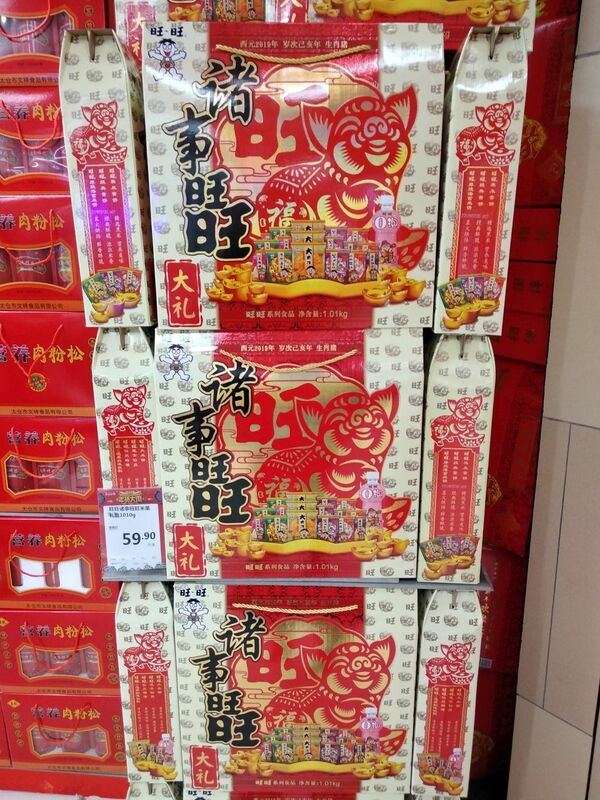 Aw, I kind of miss crazy-Chinese-New-Year-mode. All those cheesy songs on the intercom and the red packaging everywhere….!! It’s a unique sensation. I definitely don’t miss the crowds or expensive train/plane tickets, haha! I haven’t had to suffer the crazy ticket prices this year as I am not going anywhere haha. But I am trying to get mentally prepared for the crowds we will encounter when we go to the temple fair here in Suzhou! !